The world’s first video game tournament took place at Stanford on October 19, 1972, 45 years ago this week. The Living Computer Museum in Seattle is hosting an event on Thursday to commemorate this anniversary, and in conjunction, they commissioned me to write this article about the history of Spacewar and its influences. It has been fifty-five years now since the first release of Spacewar!, a seminal computer game that began as a low-key tech demo among a group of friends but soon grew to rock Western culture like a tidal wave. When a group of Harvard employees and MIT students named Steve Russell, Wayne Wiitanen, Alan Kotok, Martin Graetz, Dan Edwards, and Peter Samson created the game, they had little idea that it would evolve into one of the most important cultural developments of the 20th century. In its most basic version, Spacewar pits two player-controlled rocket ships against each other in a game of orbital single combat. Each player uses a set of switches to guide their ship through a physics-based two-dimensional simulation of deep space. Momentum and inertia play their part just as they would with a real spaceship, and a large star in the middle of the screen acts as a huge gravity well that draws the ships into oblivion if they do not carefully thrust their way around its pull. As the first interactive virtual world, in the sense of simulated physical space, Spacewar set conceptual precedents that are still reverberating in our society. The game also marked a new dawn for human storytelling, allowing interactive expressions of archetypal stories as old as civilization itself. Along the way, it also launched a massive industry. All this starting in 1961 — the year men first went into space. In some sense, the story of Spacewar is also the story its hardware platform. Like any boundary-pushing computer game today, Spacewar required very high system specifications for its time. (He writes with a chuckle.) The Digital Electronics Corporation (DEC) PDP-1 made Spacewar possible. 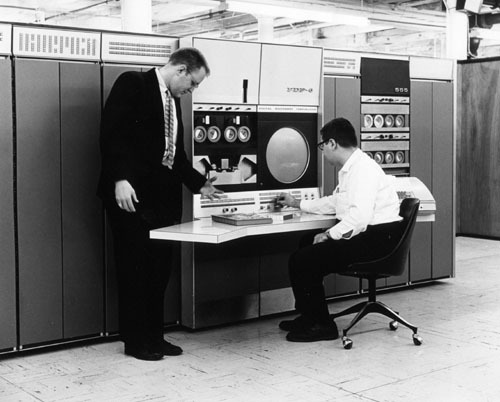 Prior to the PDP-1 and its research-based antecedents, commercial computers operated exclusively using batch processing. 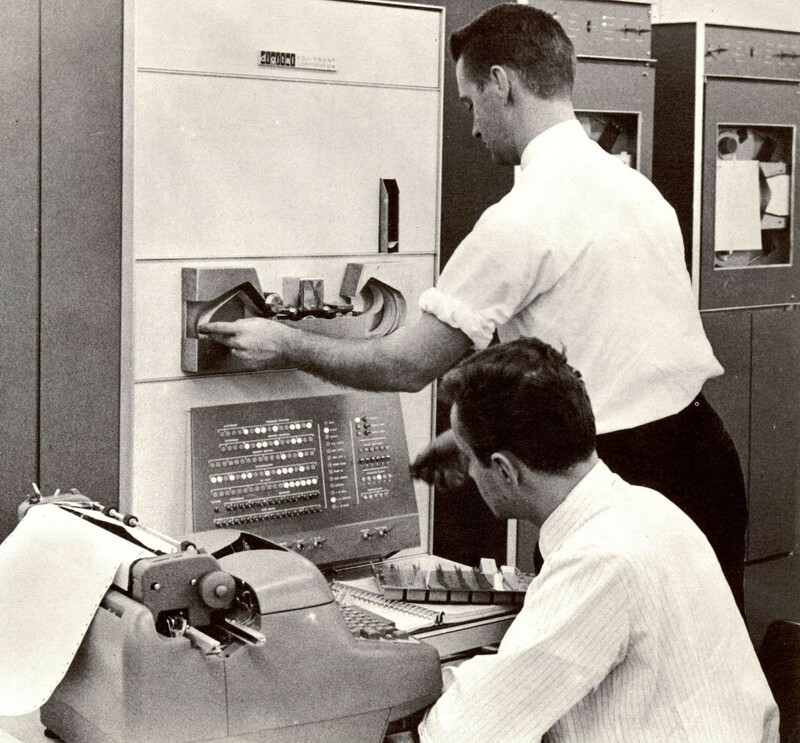 A massive mainframe computer (think IBM) would be fed input data, typically as a stack of punched cards, and the computer would much later print out the results on a roll of tractor feed paper. While processing, the computer could not be used for any other task. In contrast, with the PDP-1 and its Type 30 CRT display, an operator could feed input through an attached typewriter keyboard and see results within seconds either on a printed feed or on the CRT screen. The PDP-1 also had the ability, after some tinkering, to perform multiple tasks at once using a technique called timesharing, which opened up possibilities for future interactive computers to be used by multiple users at the same time. The PDP-1 owed its lineage to two earlier computer projects at the Massachusetts Institute of Technology in Cambridge, Massachusetts: Whirlwind, created with U.S. military funding around 1948 as the first real-time computer with a graphical CRT display, and TX-0, a transistorized version of Whirlwind with extended features. PDP-1 borrowed heavily from these for good reason — in 1957, the designer of the TX-0, Ken Olsen, left MIT and founded DEC.
Graphical programs on Whirlwind and TX-0 served as proof-of-concept ideas for visual computer programs that would follow in the coming decade — everything from CAD to musical synthesis grew from these projects. For example, Whirlwind played host to the groundbreaking ‘Bouncing Ball,’ a graphical physics demo on Whirlwind where a spot/ball on its CRT display would bounce off the lines on the screen (representing the walls and floor of a room) in concert with simple sound effects emitted from the operator console. And the TX-0 — which, in 1961, lived at MIT in the same building where Spacewar would later be developed — could run two influential games: a tic-tac-toe implementation played through a typewriter console, and most importantly, a graphical program called Mouse in the Maze. In the latter program, a user set up the walls of a maze interactively using a light pen on the TX-0’s CRT display console. When finished, a simple overhead representation of a mouse would automatically navigate the maze to reach a piece of cheese at the end. 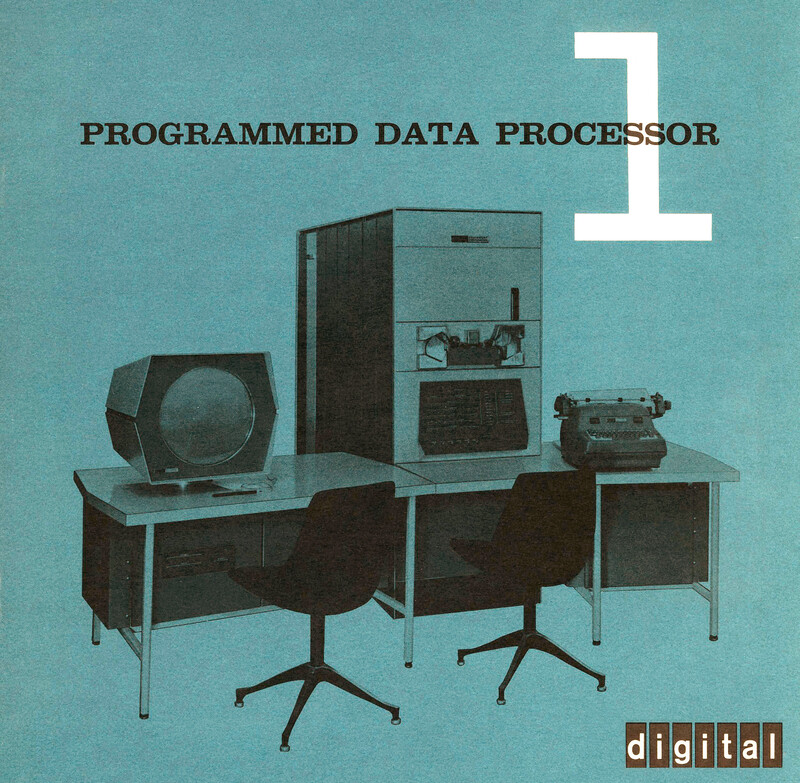 The PDP-1 marked the first time these real-time graphical programming techniques could be implemented in a mass-produced commercial product. And it came with a relatively inexpensive price tag: $120,000 for a fully-equipped PDP-1 itself, and about $20,000 for a Type 30 CRT display. That may seem pricey today (accounting for inflation, that’s over $1.1 million combined), but DEC’s machine actually undercut competing systems from firms like IBM. When the PDP-1 arrived at MIT’s Research Lab for Electronics (RLE) in 1961 as a tax-deductible donation to the university from DEC, graduate students there quickly began developing programs to demonstrate the system’s capabilities. MIT Professor Marvin Minsky created one of the earliest graphical demos, called Minskytron, which displayed a deceptively simple-looking set of swirling spots that would eventually decay into chaotic and unpredictable (but yet still algorithmically based) patterns that streaked across the screen. The PDP-1 soon attracted a constellation of young engineers and programmers who were dying to push the machine to its limits. In particular, members of the Tech Model Railroad Club (TMRC), an MIT student-based hobby group, gravitated toward the machine to use it for its own ends, such as creating a program that would assist in designing circuit layouts for model railroads. Among this group was 23 year-old Stephen R. (Steve) Russell, a former MIT research assistant who then worked at Harvard University. Technically, Russell didn’t have any official reason to be using MIT’s PDP-1 but he couldn’t resist. Soon he would bring his imagination to bear on the new machine. Russell and several friends, including Wayne Wiitanen (also a Harvard employee), research assistant Martin Graetz, and MIT graduate student Alan Kotok, grew bored of the Minskytron program as a graphical demo, and they began brainstorming ideas for a new, interactive demonstration that would take full advantage of all the PDP-1’s computational muscle. Their group ethos centered around inventing novel, fun, and exciting applications of technology and pushing capabilities to the limit. In short, they were among the first computer hackers. As such they loved everything scientific and technical, including the coming vanguard of space travel. By 1961, the whole cloth of American popular, political, and scientific culture seemed cut from space panic, propelled by the 1957 launch of Sputnik, a Soviet satellite that many Americans feared would spell certain nuclear doom from above. 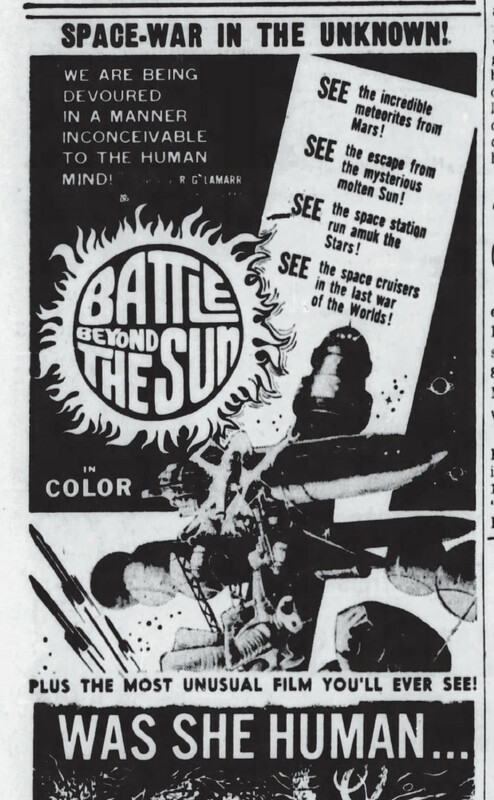 The fears launched a race into human space flight that became a cultural proxy war between East and West as both jockeyed for geopolitical dominance. Russell and his friends found themselves living in a time when scientists earned broad cultural respect; precision engineering often won the day. It was almost as if their favorite works of fiction had begun playing out in reality — they regularly absorbed low-budget sci-fi space and monster films at a local theater, and Russell in particular had been recently enamored with the pulp novel works of E.E. Smith. Smith often wrote of swashbuckling space explorers that engaged in action-packed ship-to-ship space battles. Certain events of 1961 accelerated the space race to a fever pitch. In January, the Soviet Union put the first man into space. In May, the US followed suit with Alan Shepard, and that same month, Kennedy laid down the gauntlet for an American moon shot by the end of the decade. In this atmosphere — among technically minded young engineers haunting a world-class scientific research university — how could the new PDP-1 program not deal with space? “We talked up what was a better demonstration program, and I started promoting the idea that something that taught people how to fly a spaceship would be a good thing,” said Russell in an interview with John Romero at IndieCade 2012. The record of who exactly originated the space combat concept is vague today, with some citing Wiitanen as the source, but it seems the idea quickly bounced around among the group of friends and then became a collective decision. The idea of “Spacewar!” was born. (The exclamation mark added to its official title seems to come from the melodramatic urgency of its pulp fiction roots.) Now all they would have to do is program it. Somehow, that task fell to Russell, who had earlier gained the nickname “Slug” for his tendency to procrastinate. After several weeks for hemming and hawing, Russell began work on the project in late 1961. At one point Russell cited the PDP-1’s lack of sine and cosine functionality as an excuse to delay the project, but Kotok traveled to DEC’s headquarters in Maryland and picked up paper tape copies of the software techniques needed to pull it off. Russell would have no further excuse to delay, and by January 1962, he had programmed a simple working version of Spacewar with two ships on a video display screen. With play-testing feedback from his friends, Russell’s work on Spacewar continued throughout early 1962. An early key improvement came from Dan Edwards, an MIT graduate student and TMRC member. 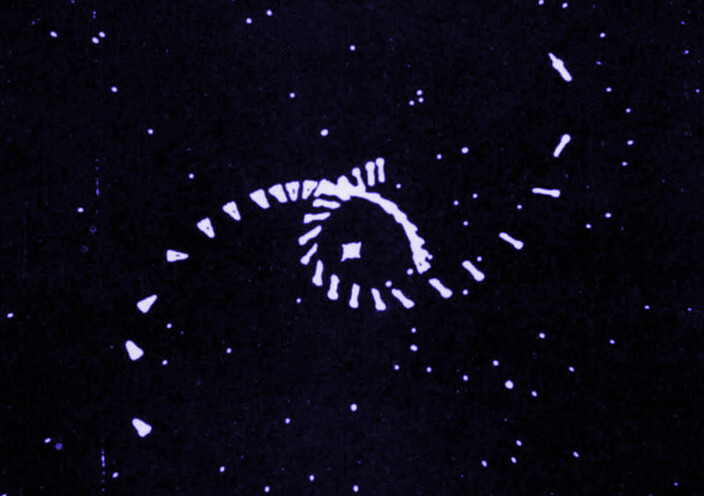 Gameplay with just two ships flying through space quickly became too boring and predictable, so Edwards introduced a large star in the center of the screen with its own force of gravity. With the star’s gravitational field at play, the ships would not only have to hunt and destroy one another, but also negotiate harsh physics that conspired to pull them to their destruction. It became a key strategic element. 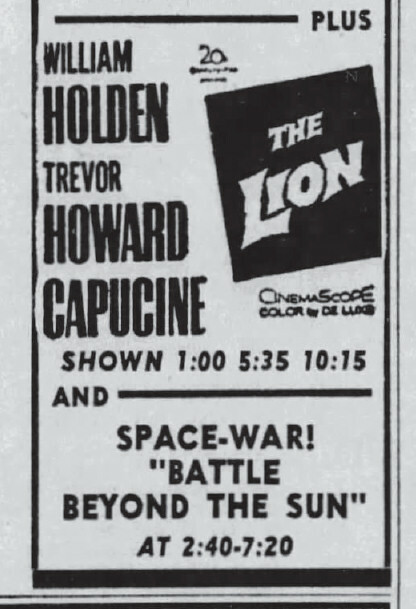 Afterward, Spacewar games often opened with a delicate gravitational ballet of rocket thrusts and orbital positioning as the ships streaked across the screen. And oh, what streaks. In 1961, the state of the art for computer cathode ray tubes came directly from military radar displays, which utilized long-life P7 phosphors that glowed in two colors (first bright blue-white, then yellowish green as it decayed away) so images would stay on-screen longer and enemy planes could be tracked along a path. In a sense, such a CRT display was itself a memory system, keeping an analog history of its own activity. 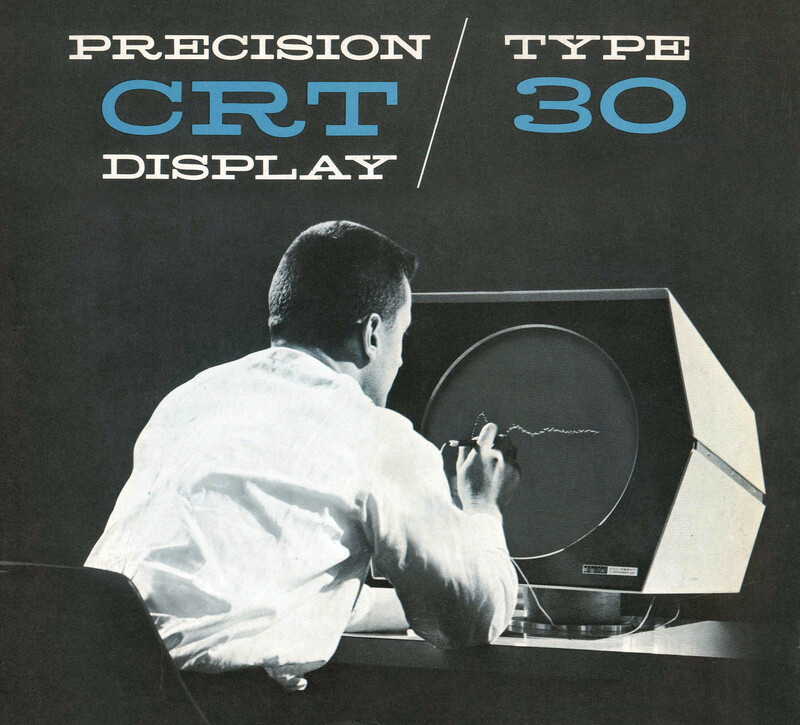 Just by virtue of its heritage, the PDP-1’s DEC Type 30 display, with its 19-inch circular radar CRT, kept these same peculiar properties, and ghostly after images of space ship trails would persist for many seconds after the electron gun had plotted out its targets. Its worth talking a little more about the Type 30’s display technique; it is often misunderstood today because it belonged to a now obsolete class of display technologies called point-plot displays. Every 50 milliseconds, the Type 30 could randomly plot any point in a 1,024 by 1,204 dot grid within a 9.375″ square area on the CRT’s face. As such, the Type 30 was neither a stroke-drawing vector display (used in oscilloscopes) nor a raster scan display (like a TV set). 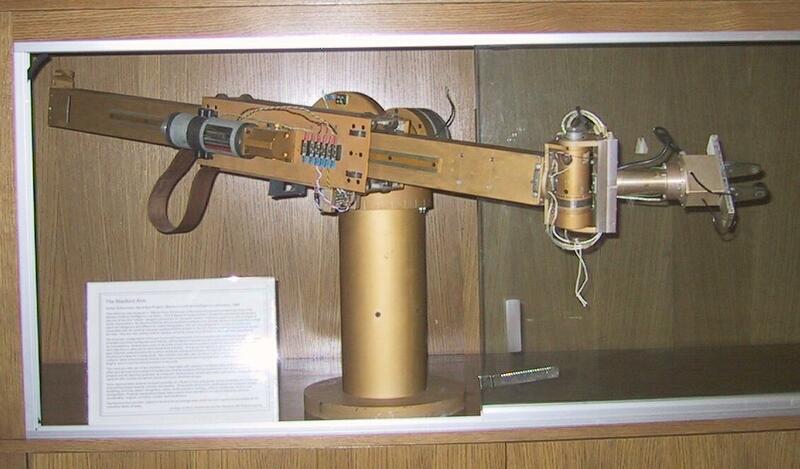 It had only one electron gun, and the PDP-1 lacked the memory for a frame buffer or bitmap system. It was quite unlike anything we use now, which may be why few understand that every graphical element of Spacewar on the PDP-1 — the ships, the torpedoes, the sun, the explosions — had to be plotted out point-by-point. Together, with its long-persistence phosphor, the game had the effect of appearing like a vector display, and every dot on the screen needed to be constantly refreshed to keep persistence. The point-plot display came in particularly handy for a last-minute game addition. 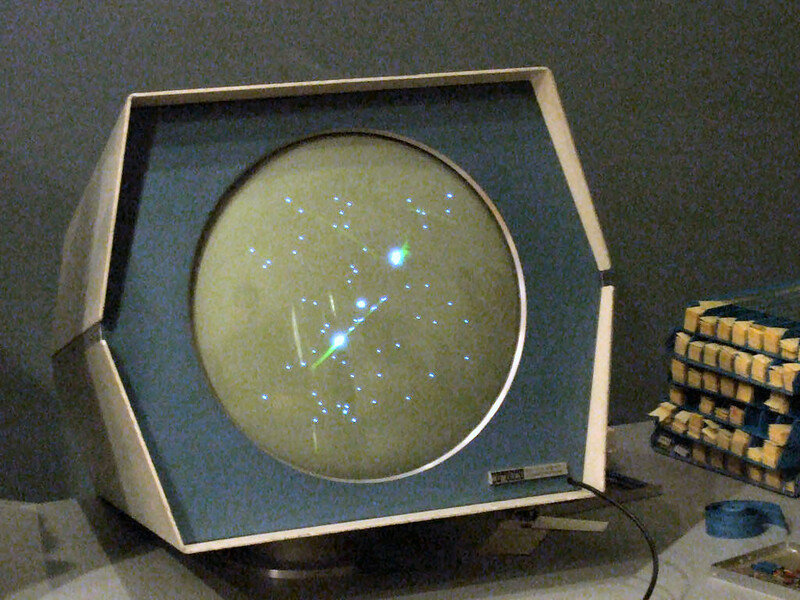 Around that time, Peter Samson created an accurate star chart on the PDP-1 called ‘Expensive Planetarium’ that plotted stars as points on the PDP-1’s CRT. Russell nested Samson’s code into Spacewar, and soon the ships actually looked like they were flying through space. During the development process, the team worked at night or on weekends, careful to avoid prime daylight hours when the computer would be in use for more serious tasks. “[It] was strictly an after-hours project; that was not part of the day job,” said Dan Edwards in a 2013 interview. MIT did not officially sanction the development of Spacewar. However, few in the department could deny the appeal of the game, and it began to attract outsiders who would line up to play it. The game consumed every resource in the machine, so the PDP-1 could not be used for other tasks during a session. As a result, the department banned Spacewar play except during nights and lunch hours. The PDP-1 remained operational 24 hours a day, and from then on, the little DEC that could spent many nights of its remaining natural lifespan as a $140,000 video game console. This popularity began to put physical wear on the expensive computer system. Originally, the team behind Spacewar played the game using the PDP-1’s front panel switches. This required two people to stand in front of the console awkwardly, arms extended, as they craned their necks far to the side to keep an eye on the CRT display. Soon, the group realized it would be better to use handheld controls attached to the PDP-1 via wires leading to a special input board on the back of the machine. After some trial and error, including using a small telephone switchboard box from the 1930s, Alan Kotok designed what might be considered the first video game controller. 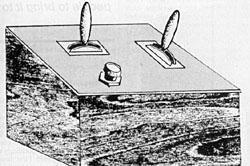 The new control box consisted of dual two-position rocker switches and a single push-button. The button would be used for shooting a torpedo from the front of the ship; one switch’s two positions provided left and right ship rotation; the other switch provided forward thrust; and the last position (added later) triggered hyperspace, a random ship teleportation function which served as a quick escape mechanism for emergencies. Spacewar’s first major version wrapped up around April 1962. At this point, the game consisted of about 2000 lines of assembly language and took up around 4.5 kilobytes of storage memory (roughly half of the PDP-1’s 4096 18-bit words of memory). A month later, the game made its public debut at MIT’s Science Open House, which invited members of the public to see and interact with MIT’s latest projects. There, the game received a warm reception. Graetz also presented a paper on the game titled, “SPACEWAR Real-Time Capability of the PDP-1” at the first meeting of DECUS, the DEC users’ society. Spacewar made such an impact in the nationwide DEC community that the PDP-1 itself, as a product, became closely intertwined with Spacewar. As a game that taxed the system to its limits, Spacewar served as the DEC platform’s most potent demonstration program throughout the machine’s commercial lifespan. DEC began shipping Spacewar with new PDP-1 machines, loading it up into core memory, which retained data even when powered off, before shipping. (Amusingly, that made Spacewar the first pack-in game.) Technicians in the field fired up the game as the first demonstration program to show the customer that their expensive new PDP-1 worked. 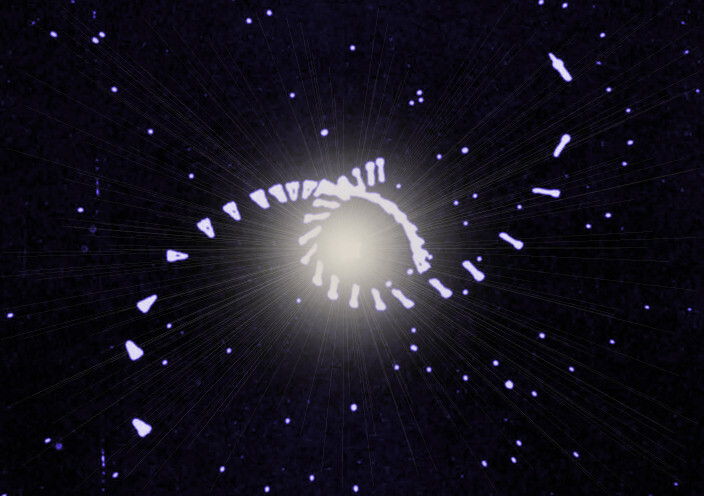 Before long, the DECUS user group began distributing the game to anyone who requested it, and soon students and faculty across the US began adapting Spacewar to their particular computer systems. The game spread much like an open source game would today, augmented and adapted along the way without any concern for copyright, patent, or even moral restrictions. It was, quite simply, free — and Russell’s sharing hacker ethos liked it that way. In late 1962, Stanford University hired Steve Russell to work at its new Artificial Intelligence Lab. He moved cross-country to California and brought a curious digital passenger with him: Spacewar. Whereas conventional timesharing gives sequential time-slices to all active processes, which means that the intervals at which a given process runs is rather variable, a program running in Spacewar Mode was guaranteed service at whatever regular interval it specified. Earnest recalls that Spacewar Mode became absolutely essential for further innovations that took place at SAIL, including breakthroughs in machine vision, robotics, and autonomous vehicles. Spacewar Mode also proved necessary for synthesizing music on the PDP-6, which, according to Earnest’s written account, “helped our computer music group, led by John Chowning, to become the world’s leading developers of music synthesizer technology.” FM synthesis, a technique that led Yamaha’s music division to great commercial success in the 1980s, arrived on the back of Spacewar. Through its real-time requirements, Spacewar’s ramifications went far beyond gaming. And yet Spacewar still had many tricks up its sleeve. Thanks to its location in Silicon Valley, Stanford University tends to fuel a regional wellspring of entrepreneurial spirit. While installed there, Spacewar inspired no less than two nearly simultaneous attempts to create the arcade video game industry. He brainstormed with friend and fellow Ampex employee Ted Dabney about the concept, and ventured the idea of starting a business to market such a game. After a back-of-an-envelope calculation about wrangling a $4,000 Data General Nova minicomputer to serve as the brains of a Spacewar arcade game, the pair put the idea on the backburner temporarily. Meanwhile, Stanford grad students Bill Pitts and Hugh Tuck also began to explore the idea of commercializing Spacewar. In 1971, they bought a $20,000 DEC PDP-11 and hooked it up a wooden console that included a monitor and controls, charging 10 cents a play at the Tresidder student union building at Stanford. They called it Galaxy Game, a nearly straight clone of Spacewar. While Galaxy Game proved popular, spawned a second version, and remained installed until 1979, the economics didn’t pan out. Using a $20,000 computer at the heart of the game ensured that there would only be one installation of Galaxy Game in the world. 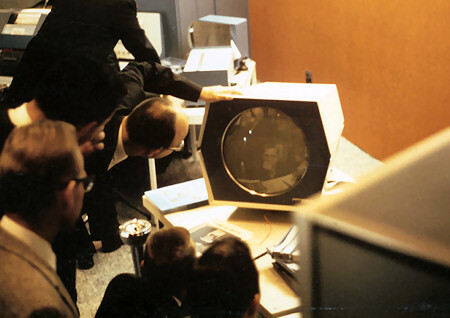 A year earlier, Bushnell had hit upon a breakthrough idea that obviated the need for an expensive computer system at the heart of the game: he and Dabney would use a regular raster scan TV set as a display and generate the game using discrete logic circuitry. Through a feat of pluck and genius, Bushnell and Dabney pulled it off, licensing the game to Nutting Associates in 1971. Nutting called their game Computer Space, and instead of being a straight rip-off of Spacewar, Bushnell adapted it into a single player game by adding machine-controlled UFOs to shoot. 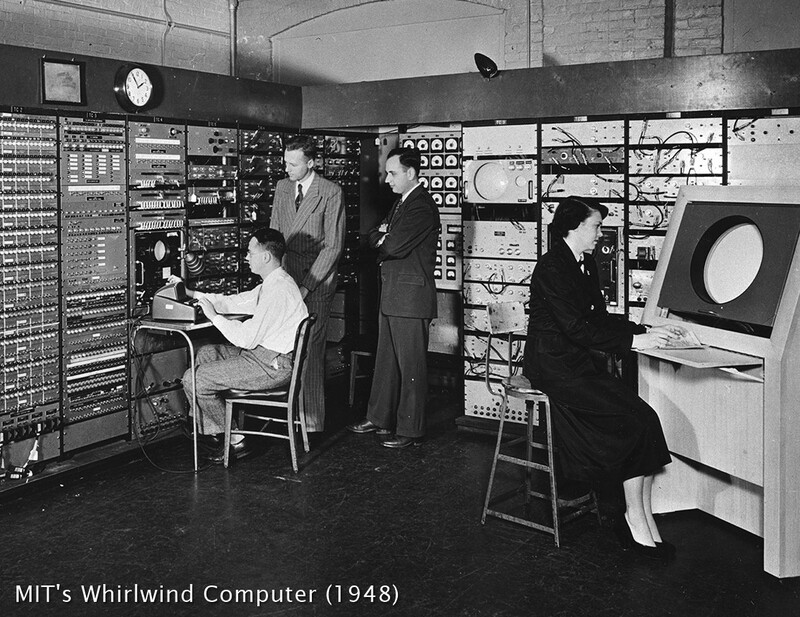 Despite its discrete roots, Computer Space pulled off the physics of space surprisingly well, although the button-based controls proved too complex and confusing for the general public at that time. 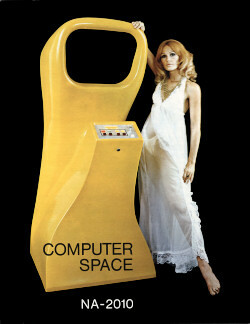 Still, after debuting in October 1971, Computer Space became the very first mass-produced video game product and gave birth to the entire arcade video game industry — especially once Bushnell and Dabney formed Atari the following year. After Atari’s formation, Spacewar’s arcade influences weren’t over. Around 1975, MIT graduate Larry Rosenthal developed his own custom vector graphics-based hardware to play Spacewar without a homemade computer system. 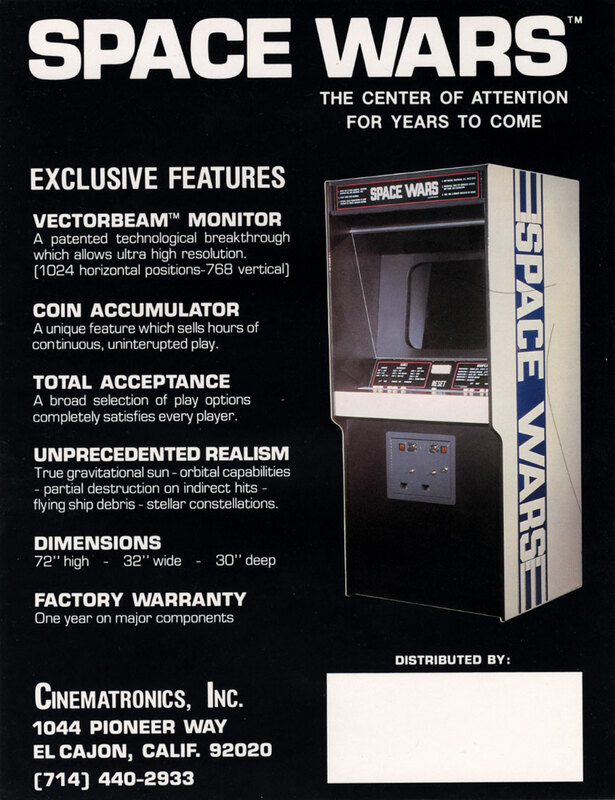 With the help of arcade game manufacturer Cinematronics, Rosenthal commercialized the game as “Space Wars,” released in 1977, marking the wide scale commercial debut of Russell’s iconic computer game. It also became the first vector-based arcade game on the market and proved very successful. After that, Spacewar gained several home adaptations, including a game for the Atari 2600 home console. In 1979, Atari made a smash-hit ‘solo’ version of the PDP-1 classic called Asteroids, giving Spacewar’s legacy a fresh boost that continues to this day. Considering all this influence, a vital question remains. Between 1962 and 1971, where were all the other ambitious real-time computer games? A 1974 directory of SAIL’s computer system — at the heart of one of the most ambitious computer research centers in the world — lists only four games as being available: Chess, Checkers, Spacewar, and Adventure. Prior to Spacewar, computer games had been very primitive affairs — representations of board games such as tic-tac-toe and checkers were common on many systems, although not all of them could be played through a graphical display. Records of various graphical interpretations of games such as tic-tac-toe and billiards also exist in the 1960s on various computer systems, but to date I have found nothing else as inventive or action-oriented as Spacewar from that time period. In this case, both the presence of students and open access were the key to formulating Spacewar. Something about youth and the freedom of experimentation at MIT made conditions ripe for a very special game that reigned supreme in computer gaming innovation for almost a decade. All these years later, Spacewar is a strange beast for historians to ponder because it is difficult to define, in just a nugget or two, exactly why the game had such an impact. It wasn’t the very first graphical computer game — games like OXO and Tennis for Two preceded it. It wasn’t the first digital computer game either — Tic-Tac-Toe and Mouse in the Maze beat it there. Even the title “first video game” is problematic, because ‘video’ is technically term of art for a raster-scan CRT display, like that used in an ordinary TV set. 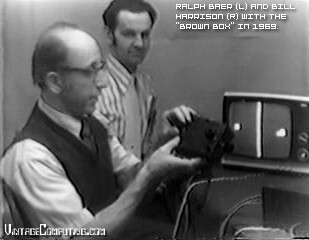 Technically, the first ‘true’ video game came from the labs at Sanders, invented by Ralph Baer, Bill Harrison, and Bill Rusch in 1967. But the field of ‘video games’ as a commercial artistic medium has long since grown to encompass many moving-image display methods beyond a raster CRT. If you want to get down to it, Spacewar was ‘the first video game as we know them today.’ Action-oriented, dynamic, representational. But in my opinion, Spacewar’s greatest impact has been as a machine-mediated storytelling system — and, in conjunction, as the original virtual world. Sociologists argue that key part of what makes us human is our ability to tell stories. Some theorize that long ago, prehistoric man sat around a campfire and recounted the thrills of a big hunt. 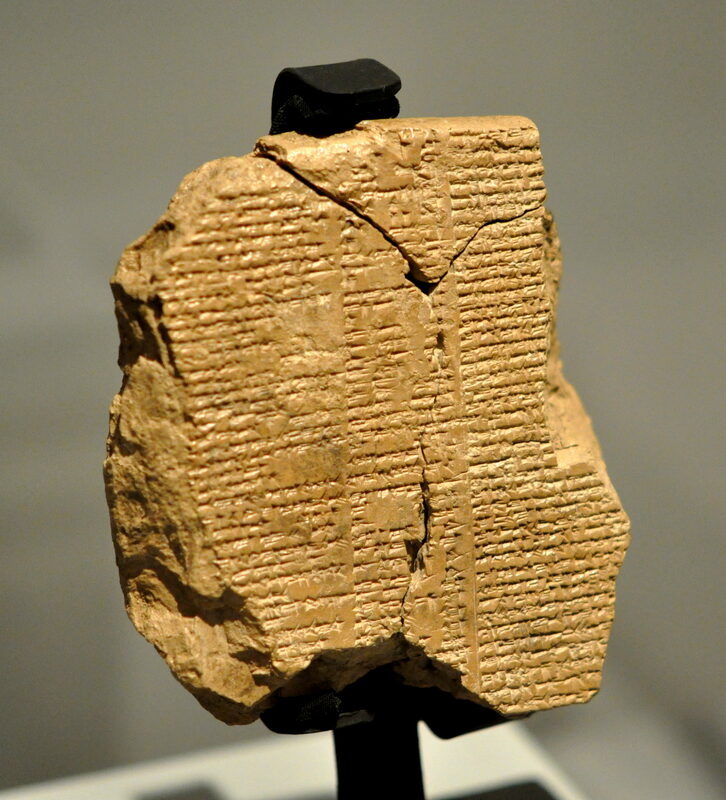 Later, stories grew to embrace civilization — tales of villages, cities, and kings, then of wars, gods, and superhuman heroes in grand epic poems that united cultures together. Up until Spacewar, those stories existed only in the human mind — or statically recorded on paper, film, or phonograph. It took an intellectual leap to craft a computer-controlled universe where fictional stories could come alive outside the human brain. Spacewar was an extension of its creators’ desire to visit the world of pulp sci-fi space combat they admired. In that way, the game’s debut marked the moment that humanity first stepped into a world of its own creation. 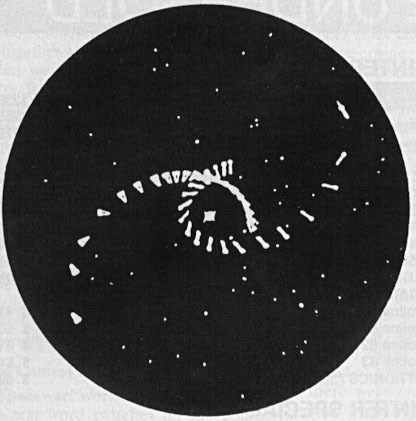 As a result, Spacewar was likely the first interactive simulation of virtual space — in the sense that a person could vicariously inhabit a computer-based world (with its own set of physical rules) and interact with it in real time. The buttons on Spacewar’s controllers became an extension of one’s body, a projection of human will into an artificial universe. Some day soon, massively multiplayer interactive stories mediated by VR and AR may become the standard way that culture is shared worldwide, and all of that began with Spacewar. And yet still, today, the original Spacewar is just as fun as ever — if you get a chance to play it. Twice a month, Steve Russell himself leads tours of a restored PDP-1 at the Computer History Museum in Mountain View, California. There, visitors can get hands-on and play Spacewar on authentic hardware with the man who co-created it. “It’s surprisingly bug free,” says Russell proudly to visitors, who often enjoy the game just as much as its first players did in 1962. This entry was posted on Monday, October 16th, 2017 at 3:12 pm	and is filed under Computer Games, Computer History, Gaming History, News & Current Events, Retrogaming, Robots, Vintage Computing. You can follow any responses to this entry through the RSS 2.0 feed. You can skip to the end and leave a response. Pinging is currently not allowed. Awesome article Benj! Very well done and informative. As a kid I can remember going to work with my mom when she worked in a data processing center sometimes on Saturdays. One of the guys there had a copy of Spacewar and he’d let me play it. 37 years or so later, I’m still playing games, albeit a tad more advanced. Thanks, TNLongFellow! I really appreciate the feedback. Great story too. 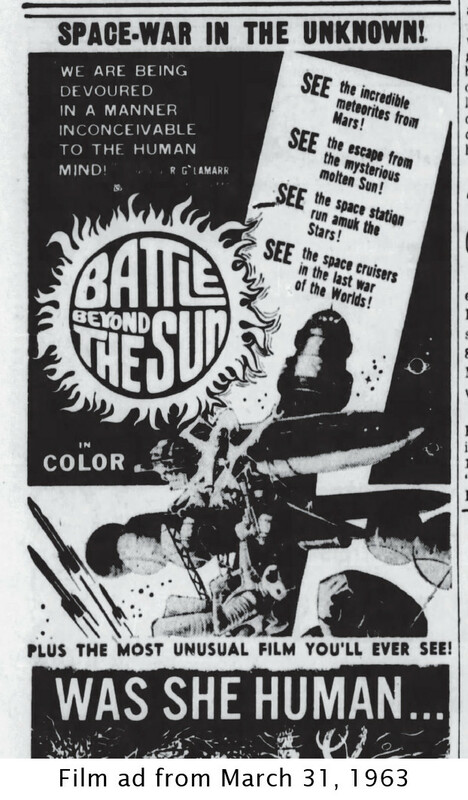 It’s interesting, in light of the relatively recent emergence of e-sports and the ongoing debate as to whether gaming can be considered a sport, that that is exactly how Spacewar was described in the April 1962 DECUSCOPE newsletter! 1. The PDP-1 as delivered from DEC did not do timesharing as defined in the US (the Brits used the term for what is now called “multiprocessing”). The multiuser nature of Spacewar! was programmed into the original game. 2. 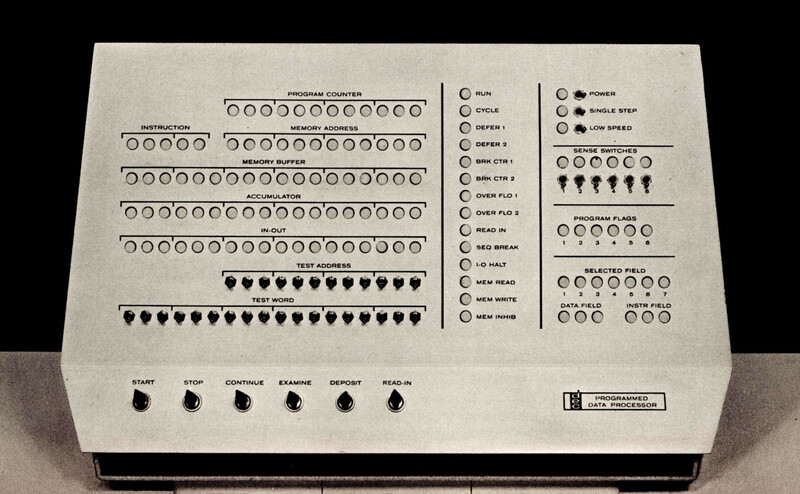 The PDP-6 was announced in March 1964, 3 weeks ahead of IBM’s System/360 line, with first customer ship in June. (The System/360 did not ship for 18 months, in October 1965). The PDP-6 was the very first commercial implementation of timesharing, that is, built in on the factory floor. Earlier timesharing research efforts involved add-on hardware to batch oriented computers, such as the Dartmouth BASIC system (on GE equipment) or the IBM 7094 at MIT’s Laboratory for Computer Science’s Project MAC. 3. You write, “Through its real-time requirements, Spacewar encouraged programmers to do some of the first “bare metal” computing that bypassed operating system baggage…” Technically, in this era, *all* programming was bare metal. Operating systems were just coming into existence, on large computer systems like MIT’s 7094 and follow-on GE 645 (for Multics), or the still vaporware IBM 360’s OS. Small computers like the PDP-1, IBM’s 1401, and numerous others, were programmed without the benefit of an operating system at all. But as I said, these are quibbles. Thank you for a great article! Fantastic story and article Benj! Really appreciate the love and craft that went into this piece. “Early on, Ed Fredkin joined Lick’s group at BBN and John McCarthy was hired as a consultant. 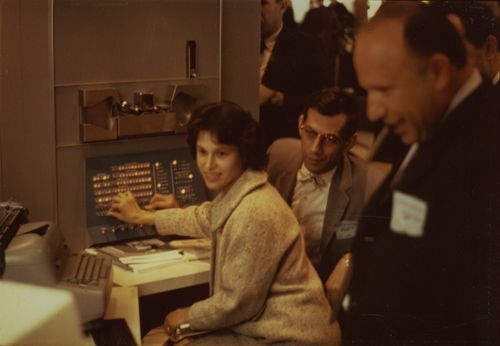 At the instigation of Fredkin, they undertook the development of a demonstration timesharing system using the first PDP-1 computer made by DEC and got it going in the summer of 1962. 2. Not much to say about this. It matches with what I found, aside from my mistake with the date. I’ll change 1963 to 1964. 3. I knew that was a stretch, because yes, everything was pretty much bare metal up until the PDP-6, and by modern standards, it was all ‘bare metal.’ I think I’ll just rephrase that paragraph. Glad you enjoyed the piece, and thanks for the feedback. It helps, since I didn’t have an editor to look over this piece. I didn’t read your Spacewar! article, William, but I am a huge fan of your site, and I’ve read plenty of stuff on it before. Keep up the great work. My dad told me a story about a couple engineers at Control Data Corp being fired for being caught playing Spacewars back in the day. Mandatory reading on the subject is “The Origin of Spacewar!” by J.M. Graetz, see http://www.masswerk.at/spacewar/SpacewarOrigin.html for a redacted copy.